These show that these phrases can blend with many styles! 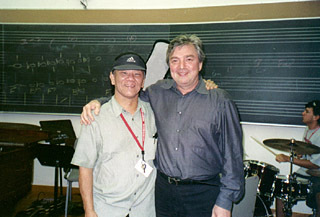 Above, Peter Hata poses with guitarist Jack Wilkins after an intense week of jazz study, practice and performance at the week-long Stanford Jazz Residency. 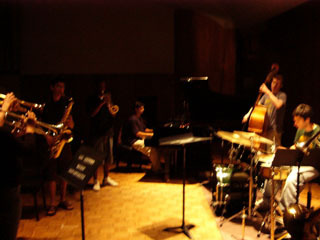 The combo performed tunes like Sonny Rollins' "Pent Up House" and Wayne Shorter's "Speak No Evil." 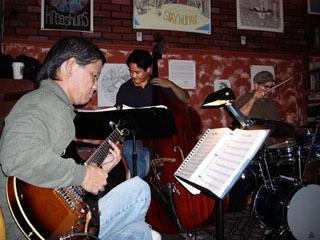 Peter Hata jamming at the Coffee Cartel with Taiji Miyagawa on acoustic bass and John Scarpulla on drums (the song probably was "Silver's Serenade"). 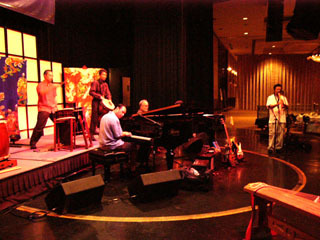 ...and performing at a Hiroshima Christmas Concert (Peter is at left). The band did some jazzy versions of "White Christmas," "Rudolph the Red-Nosed Reindeer," and "Winter Wonderland." 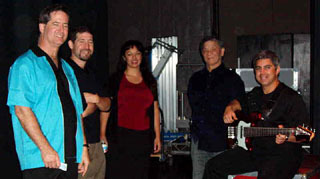 Above, Peter Hata poses backstage with Jeff Benedict (sax), Jon Nathan (drums), Veronica Arroyo (vocals) and Chris Coulter (bass) after a Jazz Combo Concert at Cal State University, Los Angeles. 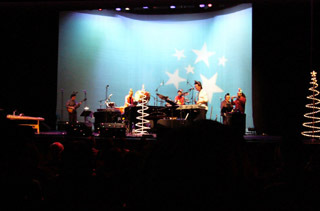 The set list included "Stablemates," "Summertime" (in 5/4), "On A Clear Day," "If You Never Come To Me," "Teen Town," and "Over Big Top" (John Scofield).